Also, we have a list of finished diploma theses on our website. A phase transition is a sharp division of the parameter space of a data processing problem into a region of success and a region of failure. This phenomenon was studied for the matrix separation problem [1, 2] and for the matrix completion problem  under specific recovery algorithms. Information-theoretic phase transitions do not depend on specific recovery algorithms and reveal what is possible in principle. Recently, information-theoretic phase transitions were obtained for the matrix completion problem  and for the signal separation problem . 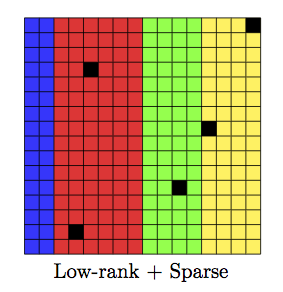 The first goal of this project is to build on the techniques developed in [4, 5] to characterize information-theoretic phase transitions for the matrix separation problem, which in its traditional incarnation separates a low-rank matrix from a sparse matrix. The second goal is to investigate pairs of matrix structures (beyond low-rank and sparse) that allow for separation and to characterize their information-theoretic phase transitions. Fractal dimensions such as the box-counting dimension or the Rényi information dimension of a random vector often appear as a measure of the vector's description complexity. Recently, fractal dimensions were shown to characterize fundamental limits in information-theoretic problems such as analog data compression [2, 3] and communication over interference channels [4 - 6]. The exact computation of fractal dimensions is, in general, hard, as explicit formulae are available only for certain classes of well-behaved probability distributions. The goal of this project is to develop, based on the results in , a statistical theory and corresponding algorithms for the estimation of fractal dimensions. The resulting estimation procedures shall then be used to gain insights into the fractal dimension of sources with structure relevant to information-theoretic problems. C. D. Cutler, “A review of the theory and estimation of fractal dimension,” in Dimension estimation and models, H. Tong, Ed., Nonlinear Time Series and Chaos, vol. 1, pp. 1–107, World Scientific, 1993. Over the last decade deep neural networks have become a staple method of machine learning. A neural network effectively implements a function as an alternating composition of affine maps and nonlinearities. The nonlinearity typically acts componentwise and is fixed, whereas the coefficients of the affine maps, often called the parameters of the neural network, need to be learned by solving the optimization problem of minimizing a loss function. This is usually done through stochastic gradient descent algorithms . This approach to machine learning works incredibly well, as evidenced by groundbreaking applications of deep learning in optical character recognition , image classification , and speech recognition . However, theoretical results describing conditions under which stochastic gradient descent is guaranteed to solve a given learning task are scarce. The goal of this project is to explore the nature of the stochastic gradient descent algorithm as applied to simple learning scenarios, and, if possible, to derive conditions on the architecture and the parameters of the neural network that yield success guarantees.